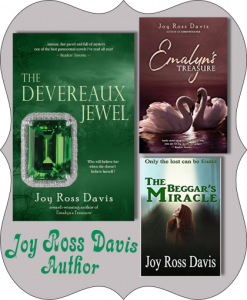 Joy Ross Davis — “I’ve been described as a novelist, a journalist, a ‘travelist’! My traveling loves include book tours to Ireland, author’s conferences all over the US and frequent trips to my beloved mountains of Tennessee (Chattanooga region). I confess to being intrigued with everything Ireland…many of my novels and stories are set in Ireland. Or revolve around Irish immigrants to America. “After writing and teaching WORDS and writing for years, I’m never bored with RESEARCH. Part of the pleasure of writing every novel is the time spent tracking down obscure historic moments, then eloquently spinning the story of the people in those situations. “I began writing as a child. My first novel ‘came’ to me during a pivotal life moment and was basically finished within a few days. The stories have been rolling from my fingertips since that time. The style following that first inspired novel has involved a lot of writing evolution from those childhood writings. 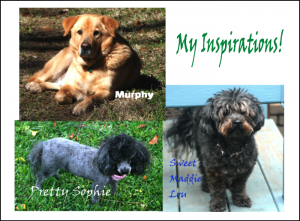 “I live and write in an historic home that is over 100 years old with my three dogs and an occasional family member guest. 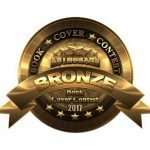 The Beggar’s Miracle — Awarded BRONZE medal from readers for BEST COVER at AuthorsDB Not the typical history of an ancient time. Rather the days of the Magdalene Laundries are visited. Bitty hasn’t spoken for many years; not since the day her mother was taken away. Now, fleeing for her life and future, she may freeze to death, except for the kindness of a beggar and his dog. The Beggar’s Miracle tells how dear, dear Bitty Brown rises above the fate for which she seemed destined. Bitty’s destiny is to carry on the family that Emalyn’s story began. 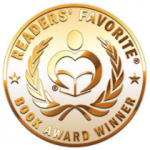 Emalyn’s Treasure — Awarded a GOLD medal at Readers’ Favorites 2017 20th Century historical fiction, paranormal novel, Emalyn’s Treasure has been a popular story among readers. Emalyn’s gracious personality and talent as a chocolatier take her in different directions than most young women of her generation. The angels and history tell a special tale with beauty and delightful romance. Beautiful swans are featured. In the Celtic mind, swans represent the rising of a new day and farewell to the old day as the sun sets. The Devereaux Jewel — My newest release in 2017 – There is a sinister secret in the Devereaux family. Lovely Anna has recently married the Devereaux heir and would prefer to settle into her delightful new home with her handsome, beloved husband. She is enjoying the grand rooms at the mansion where the Devereaux family has entertained royalty along with good neighbors for generations. The lovely new gowns appropriate for a woman of her status are wonderful! Now, with this sinister secret, the family’s future depends upon Anna and her ability to overcome terror. “Silver Sequins” — my contribution to Flash Fiction for Flash Memory, The COLLECTION, is a little different than my usual style, plot. The story does begin and end with a few threads dangling, in case the story should pick-up again elsewhere. Central character, Jeanie grows and matures from fearful to braver throughout this very, very short story. All of the stories included in the collection are between 500 words and 750 words. One of the goals for the stories, reading aloud to people struggling with memory loss, is very close to my heart. “Silver Sequins” and the rest of the collection were released as I am putting the finishing touches on the new release for my next book. “Mother, Can You Hear Me?” tells of the journey our family made as our beloved mother struggled with memory loss and finally full-blown Alzheimer’s. My next ‘novel in progress‘ features Irish country around the SligoMountains and Donegal Bay, known as Sliaba Liag. My hero will take in the views from the cliffs dropping as much as 1500 feet to the ocean. He would enjoy the panorama of the Atlantic, around to the Sligo Mountains and bright Donegal Bay. Breezes would play with the blooms of the Nóíníní and Seamair Dhearg and Seamróg (Daisies and Red Clover and Shamrock– summer wildflowers at Donegal Bay), reminding him of his “brideach milis bouquet bláthanna fiáine” — sweet bride’s wildflower bouquet. You can find me at JoyRossDavis.com. Look there for updates on events and other news. You are invited to join my Angel Pack (An angel writer can’t have a plain old fan club) for the first news and special stuff! I would be thrilled to have you follow my Amazon Author Page! I have taught writing at a professional level. During present times, I am sometimes available to speak at reading groups or women’s Christian groups or for book signings for your events. Has participated in the Bessemer Library event (track that down) and a TV event (track that down) Interested in working with reading groups long distance, using conference calls, video connections. Learn more and make connections at Telling the Heart’s Story at my website.